Add a voice-activated recorder to your computer. RecAll TM runs in the background, and starts recording when sound is detected from the microphone input. .Wav data segments may be time-stamped. Controls are available for different sampling rates and resolutions, maximum file size, sound activation threshold, and real-time ACM sound file compression, tray icon support. For those needing even more features, look at RecAll-PRO. Dictation, automatically removing pauses in speech. System Requirements: Windows 10/8/7/Vista/XP, sound card with Wav support,<1meg disk space, Pentium or faster, microphone. Benefits of Registration: Most recent version, registration code for LIFETIME UPDATES, email support, beta versions, good karma. 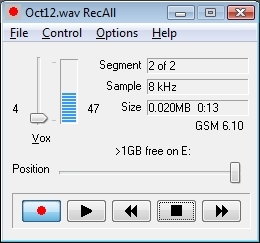 If you already installed RecAll v2.8, click here. Sometimes sound cards and multimedia can be “an adventure”. Go to our technical support page for assistance using RecAll,Frequently Asked Questions (FAQ), and application notes.